Last week I had the opportunity to shop at the Mapunapuna Ben Franklin Crafts and happily found some new Hero Arts rubber stamps. I could hardly wait to get home to ink them up. Since I have many people to write thank you notes to, it seemed to be a perfect time to try out these new stamps with old-fashioned graphics. The ornate frames and buckle style tags were cut using Spellbinder dies. It may not be apparent in the photo, but both die cuts have embossed designs. 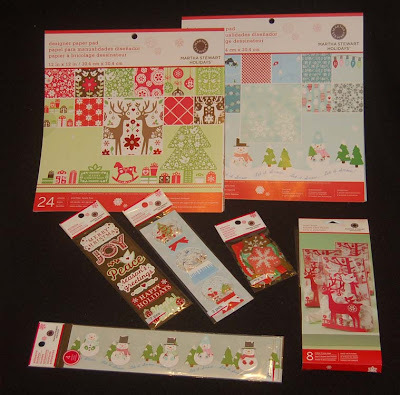 The black and white background papers came from the La Creme DCWV paper pack. The only problem I had was that the solid areas of the stamped image sometimes did not leave an even black color so I had to do touch-ups with a black small tip marker. Ben Franklin Crafts has lots of new silhouette stamps so you should pick some up. I'm sure they'll make writing thank you notes more enjoyable. Don't forget 40% coupon day is coming up. Thanks for stopping by today and I hope you'll visit again soon to see what other projects I come up with in the new year. Happy 2011! Isn't the name, 'Little Yellow Bicycle ' a weird name for a craft line? I guess the name does help consumers to remember the company. Anyway, this new company has the yummiest line of papers, stickers, embellishments, mini albums, etc. 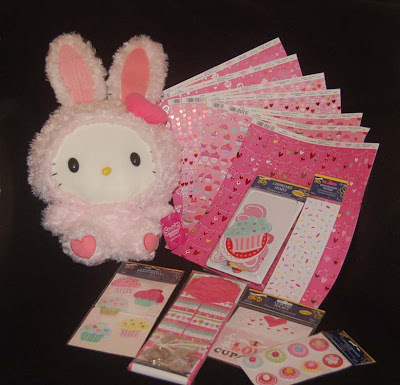 For those of you who can't ever get enough cupcake and other sweet designs, you're going to love these products. Because many of the papers have hearts on them, they would be perfect to use for a jumpstart on Valentine's Day. I can also see using these fresh and cute items on the thank you cards you are probably working on right now. You are making them aren't you? Hello Kitty is in my photo dressed up as a rabbit to welcome in the New Year. 2011 is the year of the rabbit. I was lucky enough to win the Hello Kitty doll at a game arcade in Japan. I love the arcades there because you can actually win without putting in a ton of money. I hope that 2011 is a lucky rabbit year for you too! I know it's Christmas Eve and probably no one is reading blogs, but I still wanted to post the last Christmas card I made for 2010. I was inspired by watching Cheryl Miyashiro (Life is Sweet) on the Joy of Crafting (OC16 Sundays at 6:30 pm) this week. She demonstrated a cute tea bag or candy holder with a shaker element on the front. Then as I was starting to put away my stamps and punches for next Christmas, I discovered a neat Penny Black snow globe cling stamp that I didn't get around to using. I couldn't resist making just one more card. I also found a word stamp that came with the gingerbread house clear stamp (Our Craft Lounge). It was the perfect sentiment for my final card of 2010. Cheryl's tip on cutting the foam tape really thinly worked well for the snowglobe. 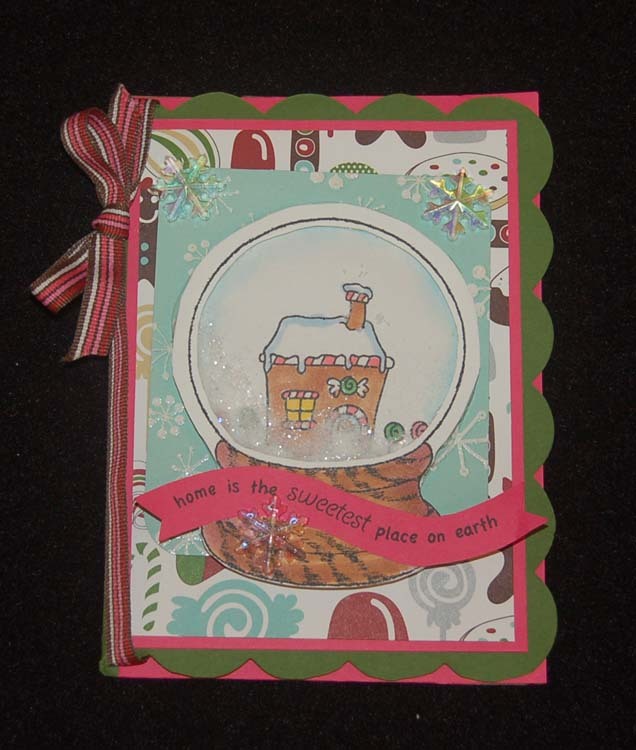 I think using the Sizzix scallop card die (the one that comes with the cupcake die) gave the card a gingerbread shingled roof appearance. I really love snowglobes and my favorite one was given to me by my oldest son who bought it all by himself with his own money from Woolworths when he was about 7 or 8 years old. The two figures in the globe are a mother and son shopping.....sweet huh? I also love gingerbread houses and one year stayed up for hours holding onto the gingerbread roof waiting for the icing to dry. The overhang of the roof was really too long which made it heavy, but I persisted and with a ton of icing I achieved success! I hope Santa will be visiting your home tomorrow morning because you've been GOOD.... haven't you ? If not, try harder next year! LOL! Thanks for taking the time to read this post especially if you are here on Christmas Eve....you really must be a devoted blog surfer. Go to bed now or Santa won't come. 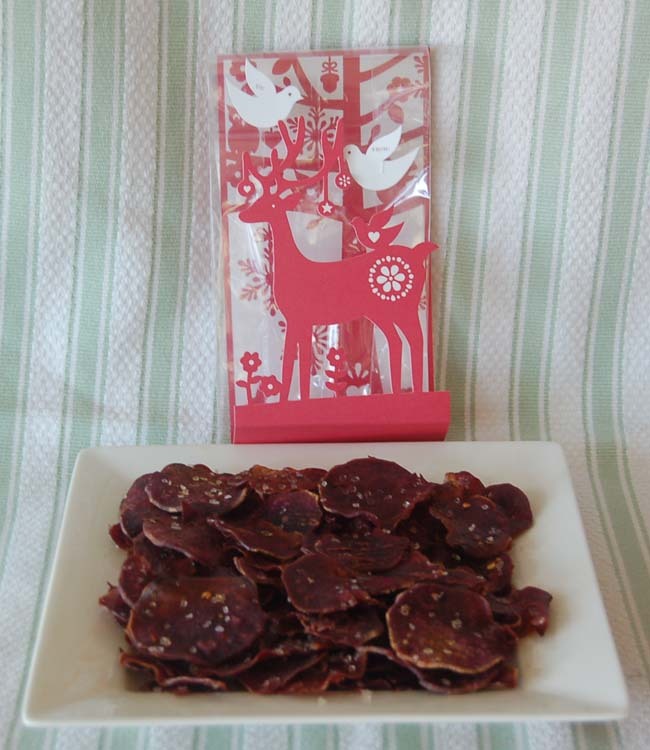 Do you hear the reindeer hooves and jingle bells? To me part of the feeling of Christmas is revealed in the scents wafting through your home. When I walked through Ben Franklin Crafts I was not planning to buy a bag of cinnamon scented potpourri pine cones, but the smell just said, "Holiday" ! I purchased a bag of the natural ones and one of unscented gold colored pinecones. 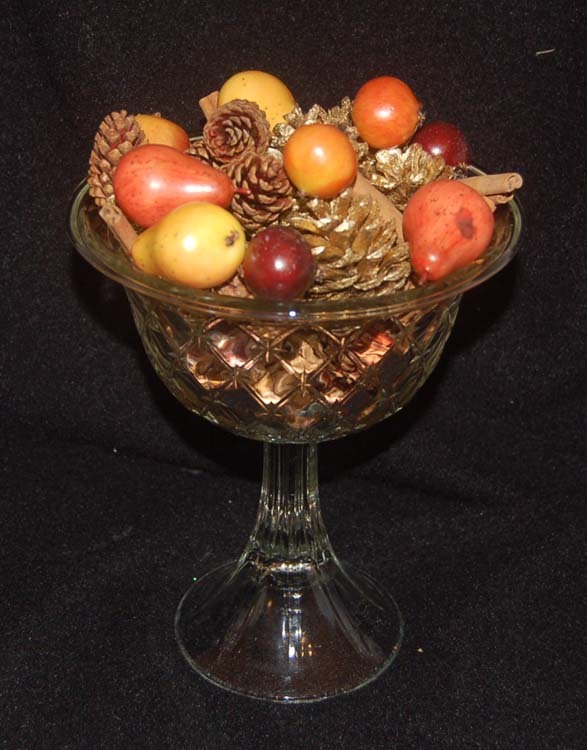 At home I found my favorite compote dish ($10 from a thrift store) and mixed the pinecones with some artificial miniature fruit from my Thanksgiving arrangement. I was left with lots of extra scented pinecones so I decided to deocrate them with bits of extra decoration/wrapping trimmings and felting wool. The heads of the pinecone people are made from Hearty Clay (with a mini Santa cap and pipecleaner snowman cap). 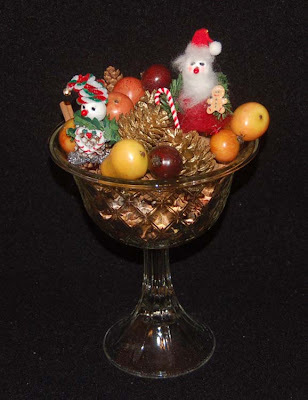 The pinecone Christmas elf/figures don't need to be in a compote and they are fun to place around the house where you want to add the sweet smell of Christmas. (Oh a flashback memory..."The Sweet Smell of Christmas" was a book that my children loved during the holidays because it had scratch and sniff stickers. We scratched and sniffed the book so much that I had to buy replacement books. If you have young children in your home this book makes a great pre-Christmas gift.) Have the sweetest Christmas ever! This year, since I had a very late start on Christmas because of traveling, I only made one batch of gingerbread cookies. 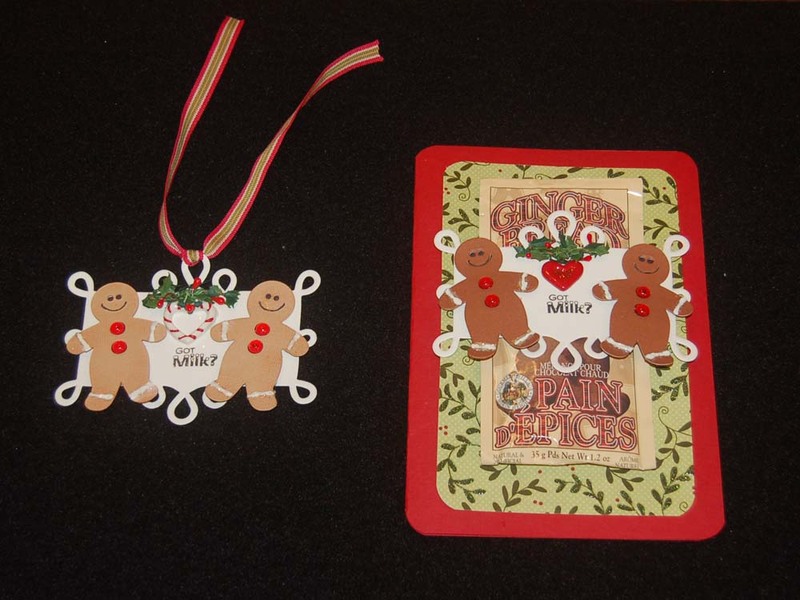 I thought that a cute tag using Sizzix dies (gingerbread boy and loop edge tag) would be perfect to accompany the homebaked gifts. When I found a 'Got Milk' clear stamp in a set with gingerbread images, I knew I had to use it on the tag. I liked the tags so much I made a large card too. 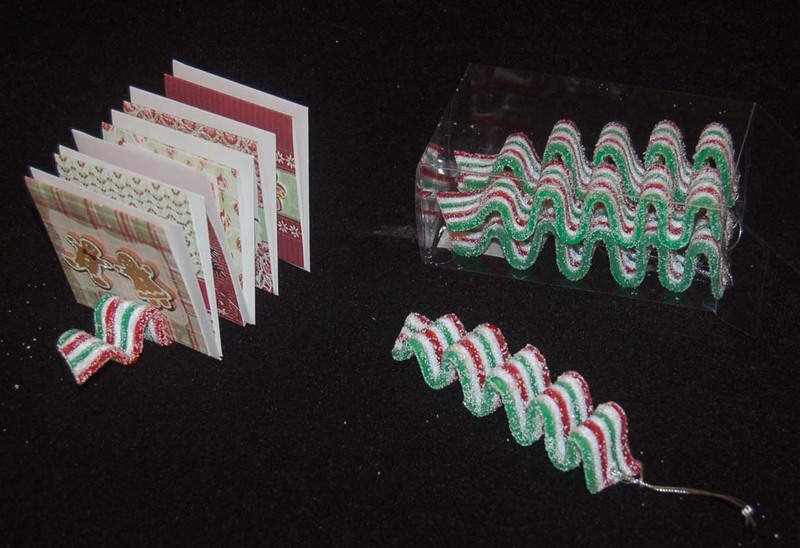 To hold the gingerbread cocoa mix on the card, I cut two horizontal slits (about and inch apart) in the green print paper and slipped the mix into the opening before taping down the printed paper to the red card. I embellished the tags and card further by gluing on some mini holly garlands, plastic charms, red acrylic dewdrops, and glitter (use white drying glue to make it look like icing). 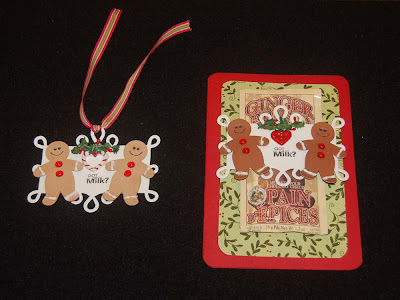 I know that this project is very late for Christmas 2010, but maybe you can keep this tag/card idea in your head and make gingerbread cookies next year. 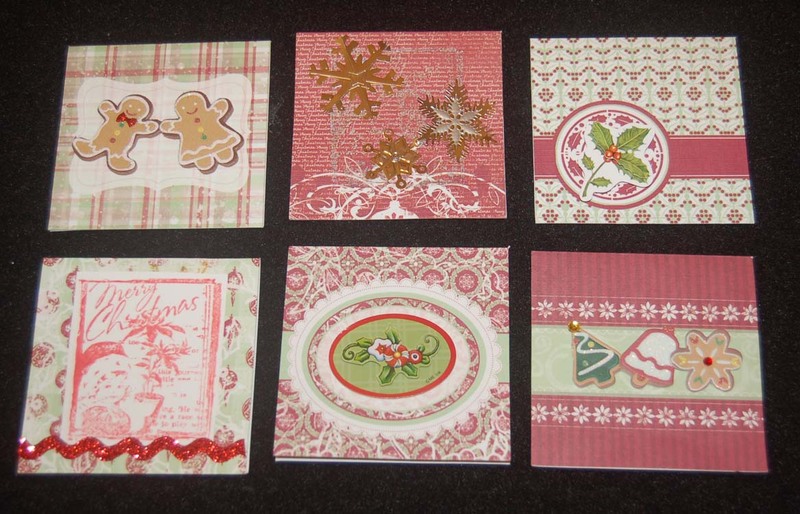 I know that I need to get an earlier start on crafting for the holidays (begin in July?) but then I say this at the end of every year....sigh....next year will be the one that will be organized! If you've visited Ben Franklin Crafts recently, I'm sure you've noticed that there are lots of very attractive artificial flowers and flower related items for crafting. Because spring is just around the corner, I'm sure that your crafting friends would love to have some. 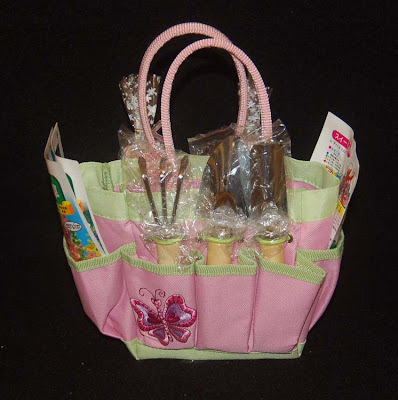 Rather that just putting the flower embellishments in a box, I found a garden mini tool tote that I knew would be the perfect gift basket for my gardener/crafter friend. Actually, I purchased the tool tote last spring when I spied it in Ben Franklin Crafts. (Never pass up a good item that will come in handy for gift giving at Christmas.) I'm sure a similar tote can be discovered at a hardware or gardening store. I included flower seeds, a flower shaped sponge, flower embellishments and cookies in the tote. I'm really proud of how perfectly this idea worked out. 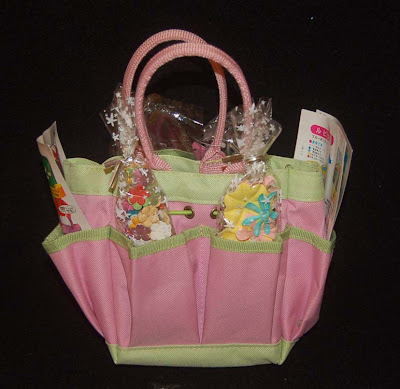 It looked great wrapped in cellophane and tied with a fancy pink and green bow. Half the fun of giving is finding the perfect gift and presenting it uniquely. Keep your mind and eyes open for special things all year long as you shop at Ben Franklin Crafts, of course! I like memo holders because I always need reminders. This one was a quickie that was whipped up from some wire and leftover candy decorations. I simply coiled the wire for the base, strung on the plastic gumdrop beads and made a couple of loops to hold the message paper or cocoa packet. I wired on some plastic candy charms using a thin wire and covered the wire with a bow. 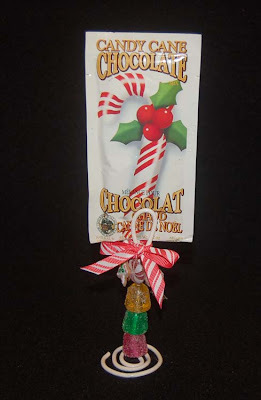 This is a sweet present to make as a last minute gift for a teacher or office co-worker. The gumdrop beads came in a large box (from BFC) so you can even make these for Valentine's Day or a birthday if you switched out the ribbon and charms with something more appropriate. Well, thanks for stopping by and I hope I helped you figure out what to give when time/money is in short supply. I'll have a few more ideas to share before taking a break for Christmas. Happy Holidays! Wrapping gifts always leaves me with strips of paper too pretty to toss in the trash. I've discovered two ways to use them up and make something useful. 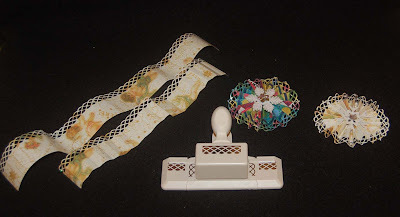 I used the Sizzix bow die to cut 5 of each size strip. The instructions that came with the die shows exactly how to assemble the bow. Because the die can cut several sheets of paper at a time, I only had to run five small sheets of leftover wrapping paper once through the die. Rather than using a brad to hold the bow together, I used a gold pipecleaner (make a small coil at one end) so that the bow could easily be attached to the ribbon on the gift. In the photo I also show how you could glue a small star or other embellishment to anchor the bow. It would be better if you had scraps of two sided wrapping paper because some of the backside of the paper does show (but that doesn't bother me). Using the Martha Stewart border punch (shown in the photo without the matching corner punch), you can also use wrapping paper scraps to make a medallion bow. Simply cut 1-3/4" strips about 20" long and use the punch along the edge. Accordian pleat the punched strip and glue (Fabri-Tac) the ends and center to form the medallion. 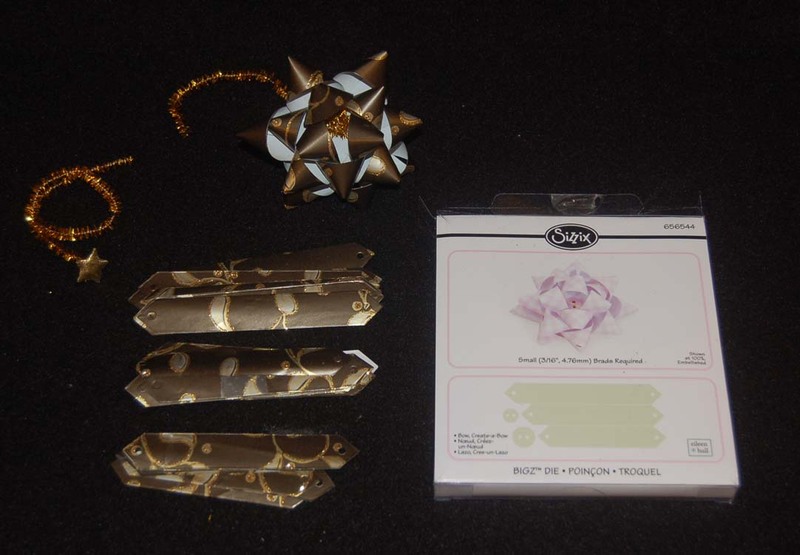 Embellish the bow with plastic or glittered paper punched snowflakes and acrylic crystals. Besides using my leftover wrapping paper, I also use giftwrapping paper that I save from gifts given to me. Sometimes the paper that friends and family use are so beautiful that it seems only fitting to recycle them by cutting around the folds and tape. Making these bows is a pleasant in-front-of-the-TV project after Christmas. You'll be SO happy next Christmas when you discover your stash of ready-to-go bows. Don't forget to make extra tags too! Make the world a better place...please recycle. Like mini-pinatas, these treat boxes can be filled with candy and used as party favors or class treat boxes. The trick to making this project quickly is the fantastic Martha Stewart fringing scissors. 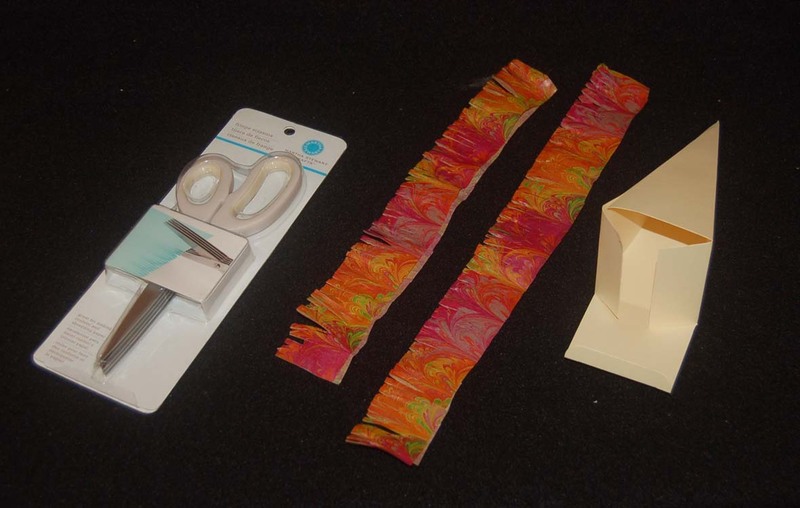 Cut long pieces of tissue paper 3" wide fold them in half so that they become 1-1/2" wide. With the fringe scissors cut the folded edge halfway through the width of the strip. One sheet of tissue paper is more than enought to cover one pyramid box. The box was made from cardstock cut with a Sizzix triangle box die. Starting at the bottom of the assembled box, glue the fringed tissue strips (pleat a bit as you glue) around the box and layer them so that you only see the fringes. For the topper, I glued small Sizzix die cut and glittered snowflakes onto large snowflake Sizzix die cut glittered ornaments and glued the two large snowflakes back to back on the gold tree. 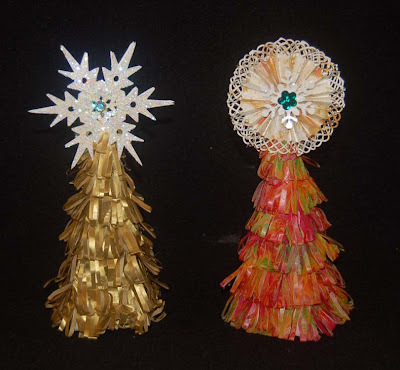 For the red tissue tree I made a medallion tree topper using a border punch and last year's recycled wrapping paper. I will explain the procedure in the next post. Well, I hope that you will try making these easy tree treat boxes. Wouldn't they look grand down the center of your Christmas dinner table? Fill the tree boxes with treats and perhaps attach a name; you will have the perfect party favor/placecard. 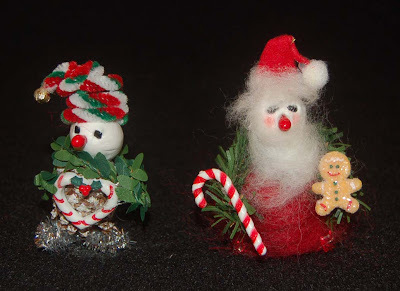 I hope this post has been informative and that you'll stop by again for another holiday crafting idea. Living in Hawaii for most of my life, I never experienced the fun of winter activities like sledding. Perhaps that is the reason I gravitated to this Penny Black clear stamp (from a set). When I saw a penguin skating card in a magazine, I knew what I wanted to do with the cute little girl image. 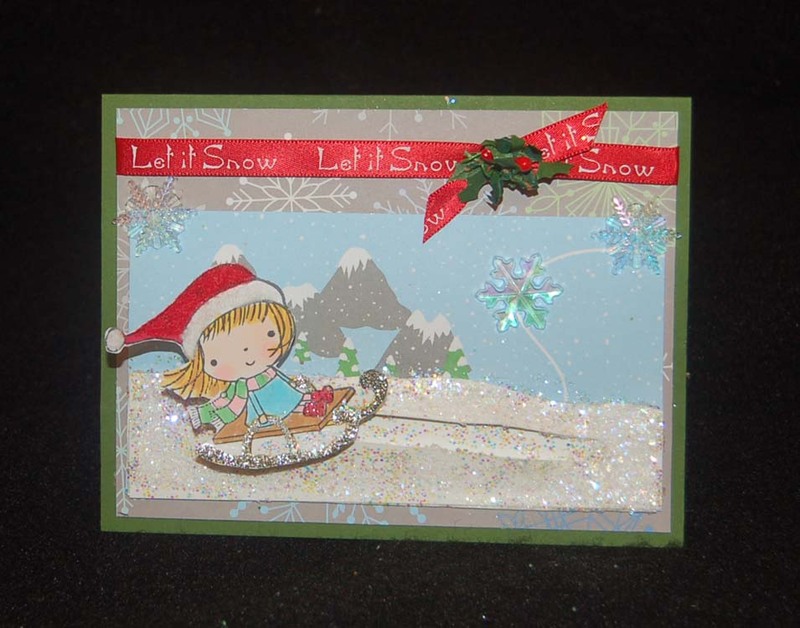 The trick to the card is the slit in the snow through which the sledding girl moves. It is made by punching two holes (regular-size hole punch) and joining them with two cuts made with an craft knife and ruler. (There is a punch or die which makes this whole cut out slit but I don't own one.) Behind the girl are three foam pop-dots (two large and one small). The small foam pop dot is between the two larger ones and is the part that slides along the opening. If you have trouble with the pop dots sticking to the card, just sprinkle on some cornstarch after the dots are stuck together. The papers used on this card are from the Martha Stewart Christmas pad of two-sided printed card stock (available at Ben Franklin Crafts). If time permits, I will submit instructions for this card to the projects section of our website (www.bfcraftclub.com). Thanks for taking the time to read this post during this very busy time of the year. Wishing you happy, stress-free crafting! When trying to decide on edible gifts to give for Christmas I wondered what to do about the health conscious people on my gift list. Since I know that sweet potatoes are full of vitamins, I decided to try making chips using olive oil (another healthy ingredient). Rather than frying them which wastes a lot of oil I simply rubbed the thinly sliced sweet potatoes (use a mandolin) with the olive oil, sprinkled them with KTA coarse chili salt and baked the chips until crispy (about 20 min. depending on the thickness of chips) in a 400 degree oven. From the photo you can see that I put on too much salt (which is not healthy) so watch that you don't go overboard. Anyway, this simple treat will please even a healthy eater. Be sure to package the chips attractively in a cellophane bag. The Martha Stewart package of Christmas designed bags in the photo are very festive and available at Ben Franklin Crafts. 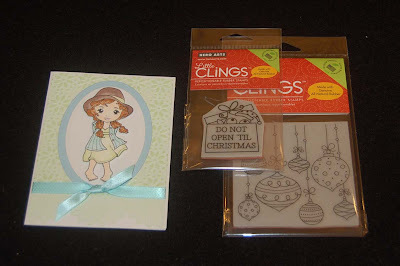 Many holiday MS products are now 25% off at BFC (craft club members get an additional 10% off) so check it out and get some good deals. When my children were little, there was a favorite book that we read and reread. It was called, "The Night Light Kids".......I think....I can't remember the author but I do remember that the pictures of the animals and the sweet story was soothing.....a great bedtime story. Anyway, the Penny Black Christmas clear stamp sets have the same sweet innocent look. 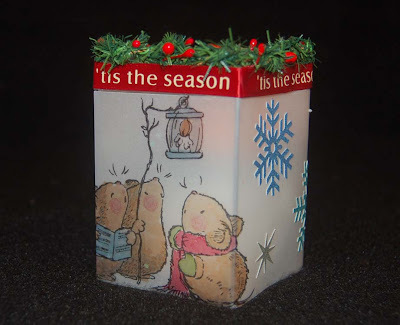 This one with the three mice and a lantern made me decide that I just had to make it into a night light. I started by stamping the image on vellum (with sparkles) using black Staz-On ink. Next I colored the back of the image with markers. Inside the 2-1/2" x 2-1/2" x 3" clear acrylic box (available at Ben Franklin Crafts) I placed a flickering tea light (battery operated) (also available at Ben Franklin Crafts). To make the light appear behind the lantern I inserted a large lump of Hearty Clay and pressed the light into it until it was in the right position. Snowflake stickers (Martha Stewart) were positioned around the sides and top. 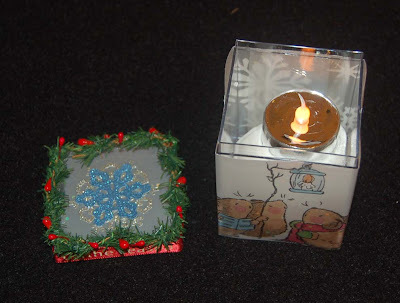 Ribbon and a mini garland (both from BFC) were a glued to the lid being careful not to glue the lid to the base of the box because the switch of the tea light needs to be accessible. 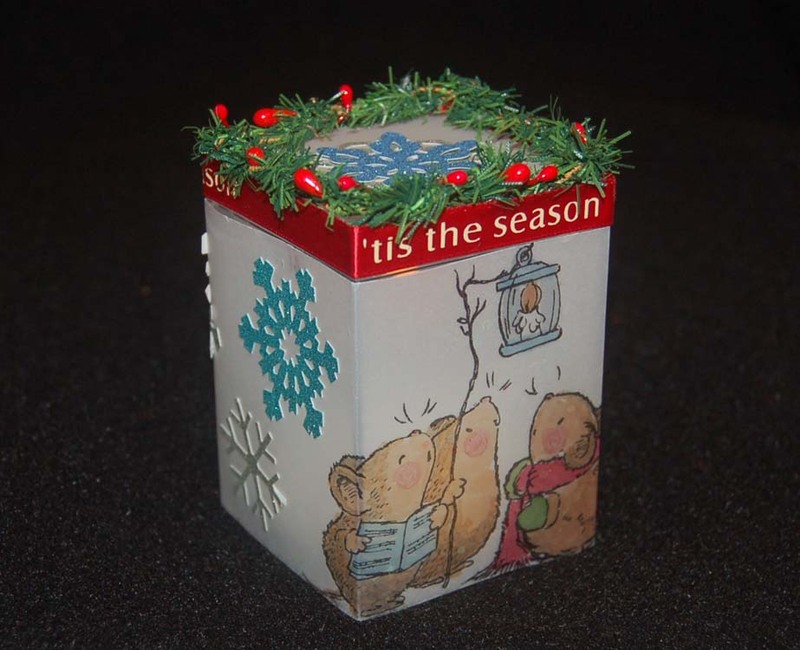 This simple project can easily be adapted to other rubber stamp designs. I really think your favorite little one will be delighted to have a night light like this. Come to think of it even an adult would be charmed by this project. Full instructions for this night light will be on our BFC website (http://www.bfcraftclub.com/) as soon as possible. I'm sorry that I haven't commented on your blog sites for a while because I was on a trip in Japan. 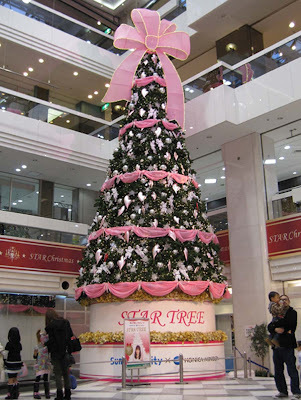 The photo above shows a gigantic tree that was in the shopping mall of the Sunshine City Prince Hotel where we stayed. Japan becomes more Christmasy every time we visit around the holidays. There are artificial trees in all the major stores and lots of ornaments and cards. I guess everyone wants occasions to celebrate and give gifts. I tried leaving comments on your blogs sites while in Japan, but they all appeared only in Japanese so I just did some blog surfing. The photo below is of a card and some new HA stamps that Cheryl (Life is Sweet) sent me. Isn't her card so sweet? You can't see it clearly in the picture but the background is charmingly embossed with flowers. As with all of Cheryl's work, the card is well crafted and beautifully simple....much like the artistic craft work in Japan. Thanks again, Cheryl. Look what I discovered at Ben Franklin Crafts! These American Girl product will surely bring a smile to someone special this Christmas. Shown here are a sparkly watercolor set, a creative card-making pad, a kit for making 12 funky felt pins, sweet treat dimensional stickers, and a bracelet kit which makes 10 paper chain items. Although these products are for young girls, I found them irresistible. I just know that I can incorporate them into some of my craft projects. 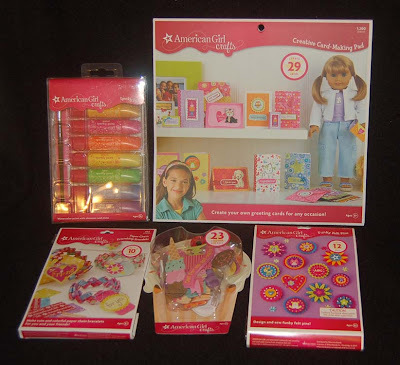 If you want something fresh to give as a gift or for yourself, come to BFC and check out these (there are lots more not included in this photo) American Girl cool stuff. Oh, I almost forgot that I had a second photo on this post. 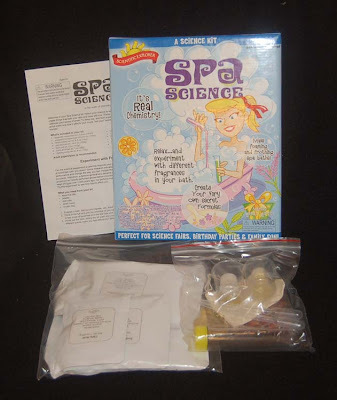 I wanted to show you one of the many 'science' related gifts we have at Ben Franklin Crafts for your budding genius at home. These boxed kits range from the usual chemistry sets to unique ones to make sour candy, perfume, or other fun products. If you know someone who enjoys creating things and learning the science behind it (not only kids love this stuff), BFC is the place to go this Christmas for your shopping needs. 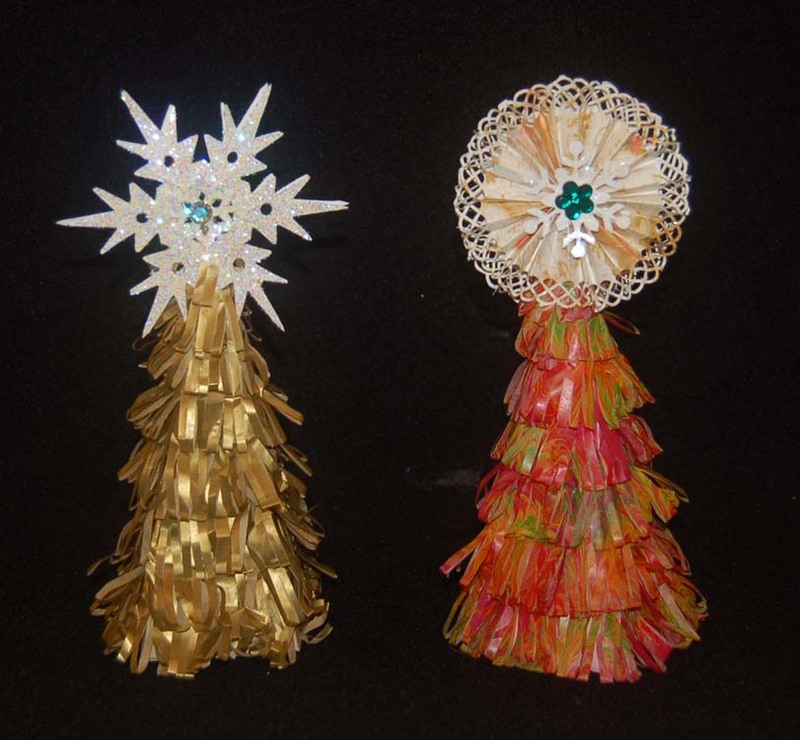 At the end of every holiday season I think, "How can Martha Stewart top her Christmas craft line next year?" Then when I see the new holiday line the next year I say, "Wow! She did it again. " 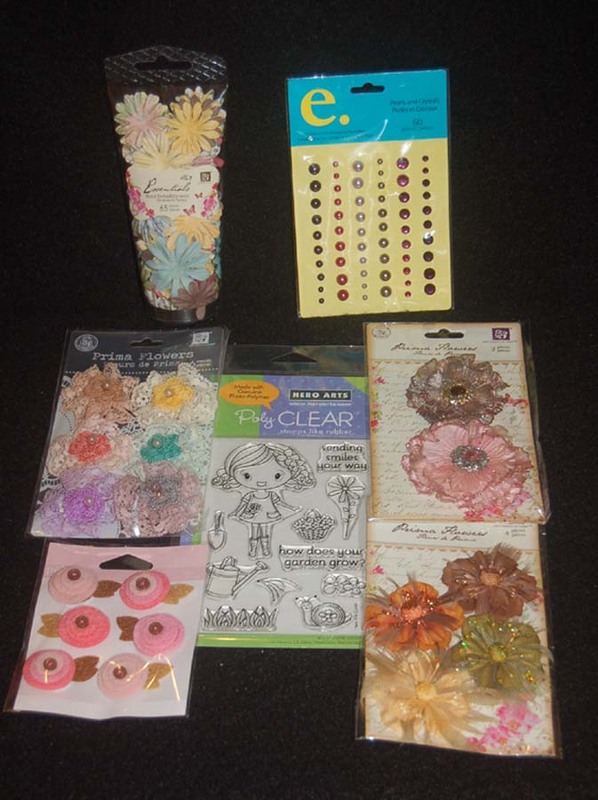 I like this year's assortment of stickers, papers, punches, and embellishments even more than last year's. Ben Franklin Crafts has a copious supply of Martha Stewart craft goodies this year but I know that they will go fast. I especially love her line of Scandinavian inspired products...so graphic and timeless. The amount of stickers in the border sticker packages from Martha Stewart are somewhat hard to determine because they are layered to save space, but some of them have a huge amount of product especially if you cut the adhesive backed borders into individual stickers. The glittery MS paper pads are so special; I know you'll buy at least one when you see them. Finally you have to check out the Martha Stewart treat bags/boxes because if you bake your own goodies you'll want to have something really great to showcase your homemade gift. I know you want to make your own decorated die cut bags, but it's good to have some pretty pre-made ones around in case baking takes more time than you anticipated. Afterall, try as we may we really can't do it all.... so don't stress out. Be good to yourself this holiday season and enjoy making your crafts/bake goods but take some shortcuts with no craft guilt by using some of the beautiful products available at Ben Franklin Crafts. 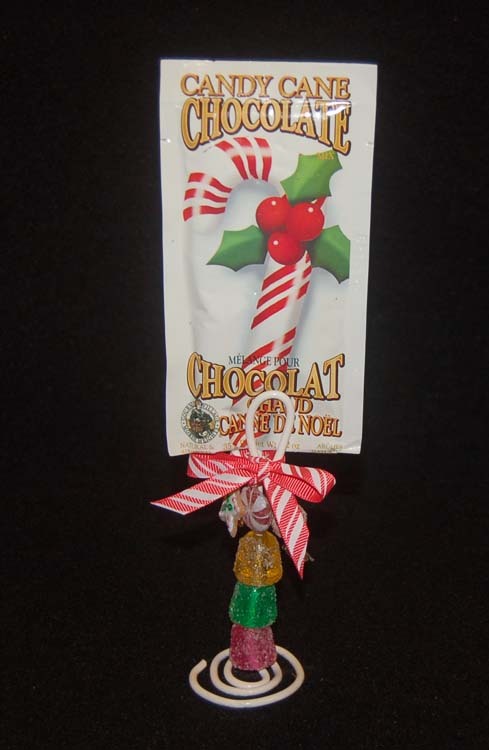 When I was a little girl one of my fondest Christmas memories was receiving a container of ribbon candy in the mail. I don't know who sent this gift to my parents every year but I was enthralled by the colors and shapes of sugar candy (some filled with peanut butter cream). When I spied the plastic ribbon candy ornaments at Ben Franklin Crafts, I knew that I had to buy a set (6 for $7.99) of the sugary looking replicas made by Sierra Pacific. Originally I had planned to hang them on our tree but then I realized that they looked like a letter or toast holder. 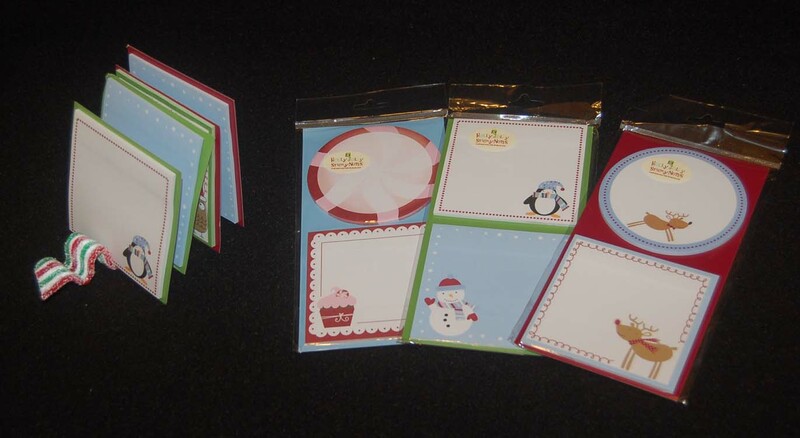 I decorated some mini notecards w/envelopes by applying stickers to some pre-made ones. (You can easily make them from leftover cardstock cut to fit mini envelopes.) Then I filled the spaces of the ornament with the cards and I plan to wrap the whole set in a clear cellophane bag tied with a ribbon. I think a set like this would make a perfect early Christmas gift for a co-worker or teacher because after using the cards he/she can hang the ornament on his/her tree. 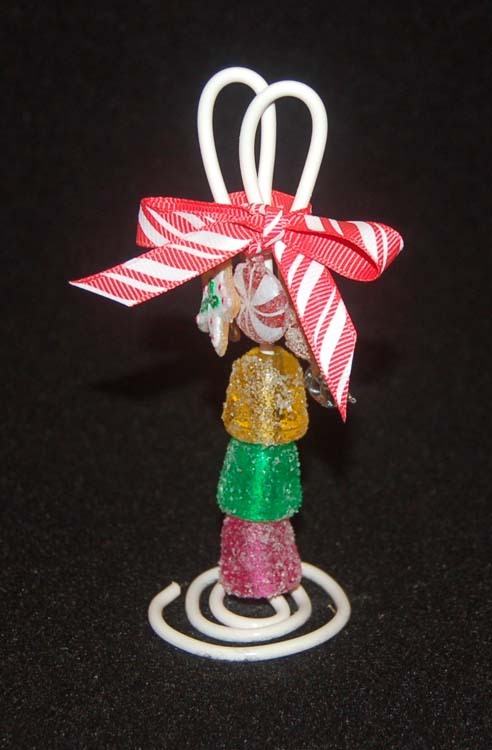 The candy ornaments also come in a red and white version. If you don't want to make cards or tags, you can fill the ornament with sticky note pads. The ones in the bottom photo are from G Studio and come two in a package for only $1.25! (I just cut the cardboard between the two notepads.) Now that's an inexpensive, easy gift to prepare for someone who needs a thank you. Hey, you could wrap individual cookies and place them in the ornament for a unique presentation! Well, I hope this post has given you some new ideas for gift giving. Come and visit again for a peek at what goes on in my brain during the holidays.